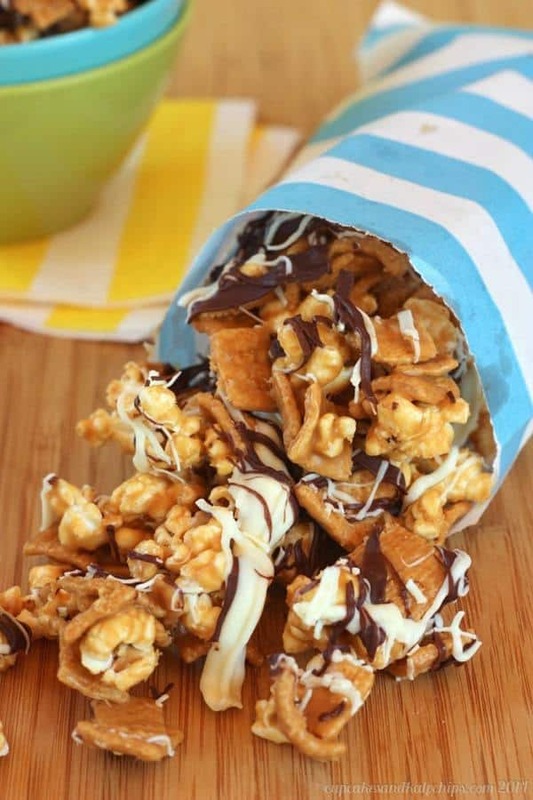 Sweet and salty, peanutty and crunchy with a yummy drizzle of white and dark chocolate. It’s time to start singing “Take Me Out to the Ballgame” because we’ve got Popcorn & Peanuts! 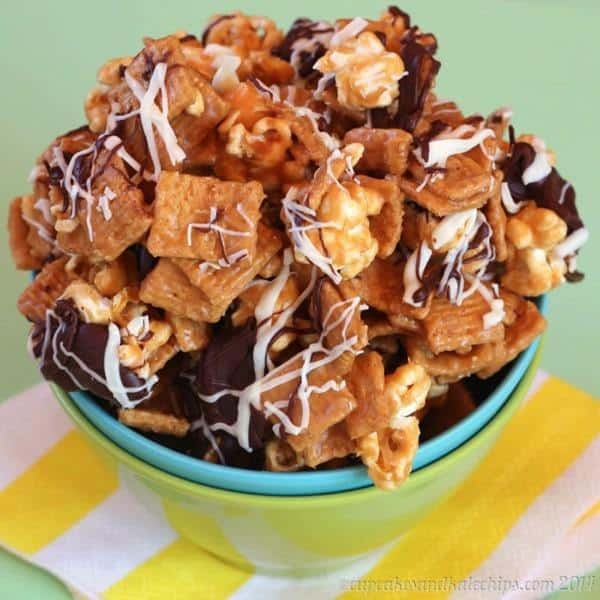 This snack mix may be a bit too sticky to bring out to a baseball game, but get yourself a bowl to munch (and a napkin) on while you cheer on your favorite team on TV. 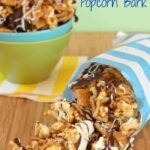 Everyone’s favorites can be found in this sweet and salty Peanut Butter Golden Grahams Popcorn Bark. I know to those of you that read the blog regularly, you may think I am all about food and my kids. But one of the other things I love is baseball. Well, specifically, the Yankees. Actually, my husband would say that I am not a baseball fan, I am a Yankees fan. I actually would have to agree, because you are not likely to find me watching any old baseball game. Really, just the Yankees. More specifically, I might actually just be a Derek Jeter fan. So I am really kinda sad this year, with it being his last year before retirement. I’ve been following his career since his rookie season. I was just a silly high school girl then, and totally had a crush. In fact, I still kinda do. But I was actually, really, seriously into the game. I’ve learned a lot and have taught The Hubby, who I’ve now converted to a Yankees fan. But after this year, with Derek gone, I’m not sure I’ll be able to watch with someone else as the starting shortstop. It’s just not gonna be the same. I might even have to start following another team. 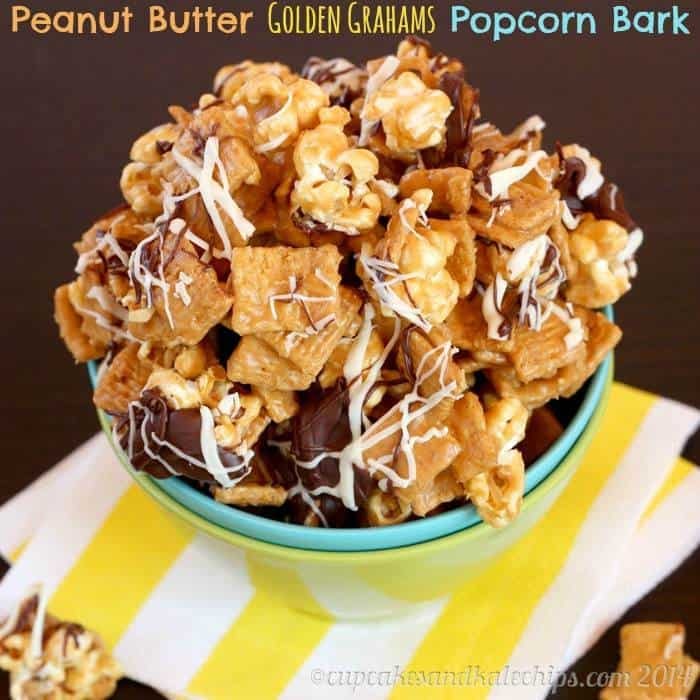 Oh my goodness, this Peanut Butter Golden Grahams Popcorn Bark is dangerous, guys. It was all I could do to keep myself from eating it all. And honestly, since I have to watch the wheat, I was only picking out the popcorn and chocolate, but I didn’t want to stop. 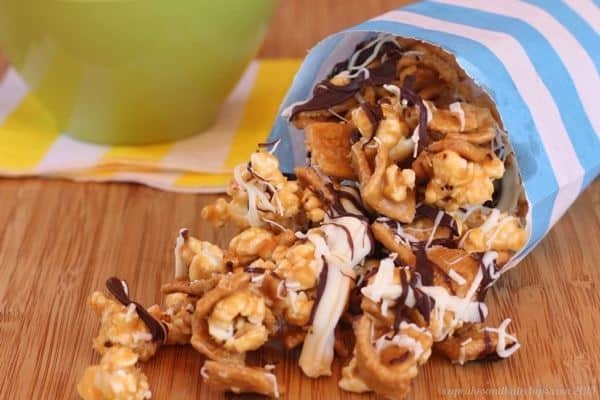 Sweet and salty, peanutty and crunchy with a yummy drizzle of white and dark chocolate. Does it get any more delicious?! 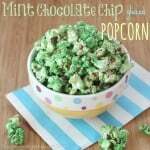 I only wish I had added some peanuts, too, so I am adding that into the recipe as option, but I really think it should be done. Crunchy, munchy. Soooo darn good! Line baking sheet with a silicone baking sheet or wax paper. In a medium microwave-safe bowl, microwave the peanut butter and honey on high for 30 seconds, then stir until blended. Microwave for an additional 15 seconds, if needed. 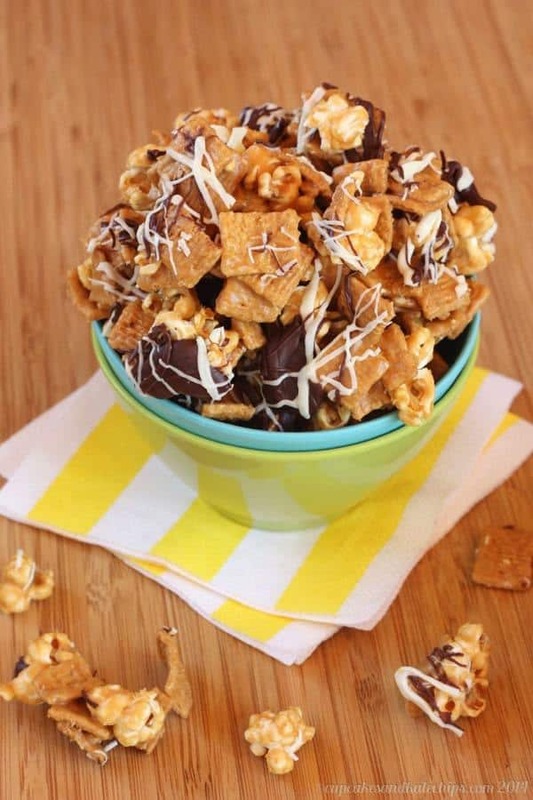 Pour the peanut butter mixture over the popcorn and cereal mixture and stir until evenly coated. Spread into an even layer on the prepared pan. 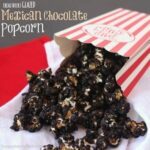 Melt the white chocolate chips and semisweet chocolate chips in separate small bowls in the microwave at 50% power in 15-30 second intervals, stirring until smooth, or over a double boiler and drizzle over the popcorn and cereal mixture on the pan. Refrigerate until set and firm (it will still be sticky). 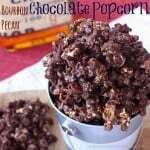 Break into chunks and store in an airtight container. Doesn’t that look amazing, love it, plus thanks for including us in your post!! Haha! Yeah, I picked out my fair share of chocolate! Nice! I love this snack mix combination. My family ignores baseball until the world series and even then they only half-heartedly keep track of what team is winning. Now, put this mix in front of them during football and it would be all over! I am definitely going to revisit this come tailgating season!! Gorgeous! I’m sure they are as tasty as they look, too. Oh My Gosh! I’m a huge Yankee fan too! I never miss a game! I’m sorry to see Derek Jeter leave the team too. I agree with you, it just won’t be the same. There have been a lot of guys coming and going the past few years. However, the game must go on, Right? 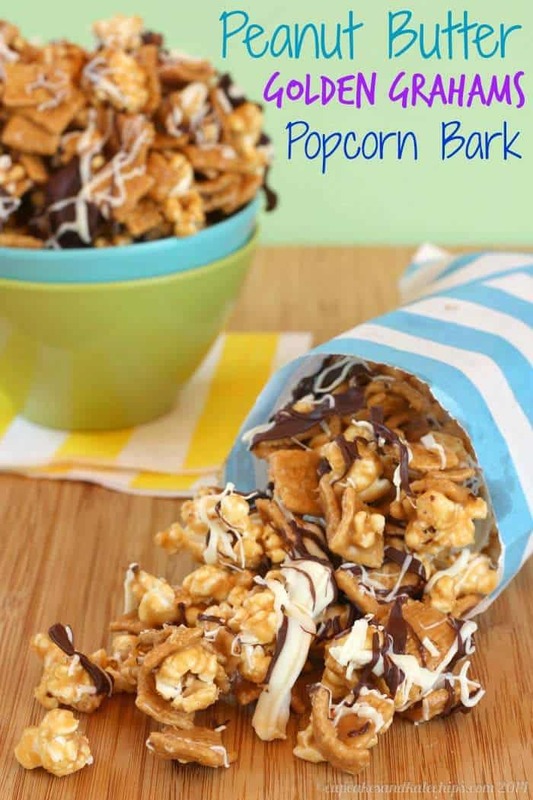 The popcorn bark looks yummy! I’m going to make it for the next game. I love sweet & salty! Pinned it !!! I love your Blog! Oh my god this looks like it’d be so addicting! YUM! Purdy sure I would not share this. With ANYONE! Seriously. YUM!